According to the Writing Instrument Manufacturers Association, approximately 3.6 billion woodcased pencils were sold in the US in 2008. These pencils were made all over the world: in the US, Mexico, China, Germany, Japan, India, Korea, and a smattering of other locations. There are dozens of manufacturers producing an amazing array of brands, models, sizes, and graphite varieties. With so much variety in the market, how are the pencil curious to choose? 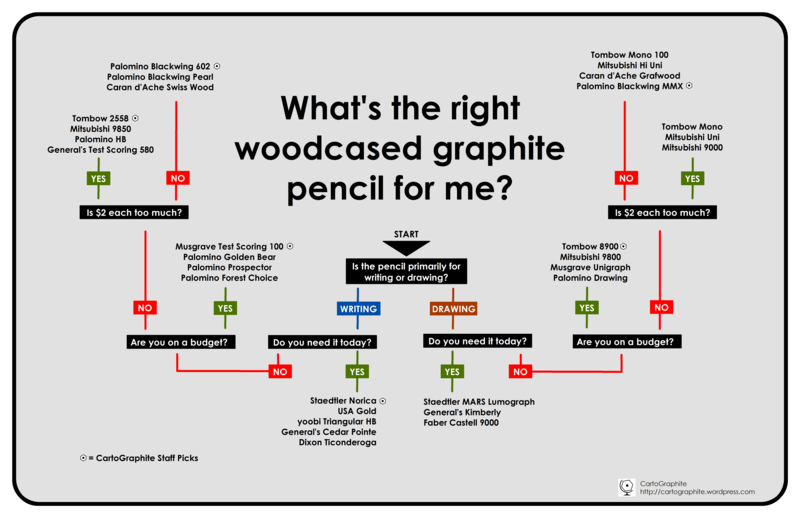 We have developed a simple flowchart to walk you through the selection process. Just find START, answer a few easy questions, and find the perfect pencil(s) for you! We have limited the selection to pencils generally available in the US, either through local retailers or via selected online vendors. The categories and decision points on the chart are arbitrary and fairly subjective, but we think they help make sense of the modern American pencilscape. Once you have identified the right pencils for you, go get some from one of the shops on our map or on our list of great online sellers! If you needed a pencil with a harder lead for writing, what would you recommend? The pencils on the chart are skewed towards softer leads, since that is what I prefer. On the writing side, the Tombow 2558 in H could be suitable. The yoobi HB is an inexpensive alternative that can be found at Target. On the drawing side, the Mitsubishi 9800 or 9000 in H or F would be good choices. You can work your way up the H scale with those models or most of the other drawing pencil brands if H or F are still too soft.